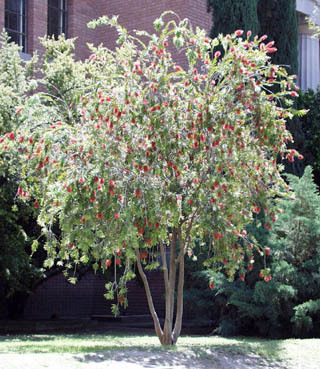 The Weeping Bottlebrush is a medium growing weeping tree that grows 15-30 feet tall and is hardy to 20 degree. It is an evergreen tree and likes regular water. The Weeping Bottlebrush tree has bright red bottle brush like flowers that bloom in late spring to early summer, striking and attractive flowers that last as long as 4 weeks. The tree has weeping stems, attractive trunk growing gray and fissured with age. It is an evergreen, single or multi-trunk tree. It has low to medium, flower drop (tiny filaments).